Jets offensive coordinator Jeremy Bates wants the quarterback to get to the line with 15 to 20 seconds on the play clock. FLORHAM PARK, N.J. — Sam Darnold has shown he can get rid of the ball quickly. The next thing the Jets rookie quarterback must master: Getting in and out of the huddle swiftly. Darnold has improved in that area as he’s gotten more comfortable with the offense. 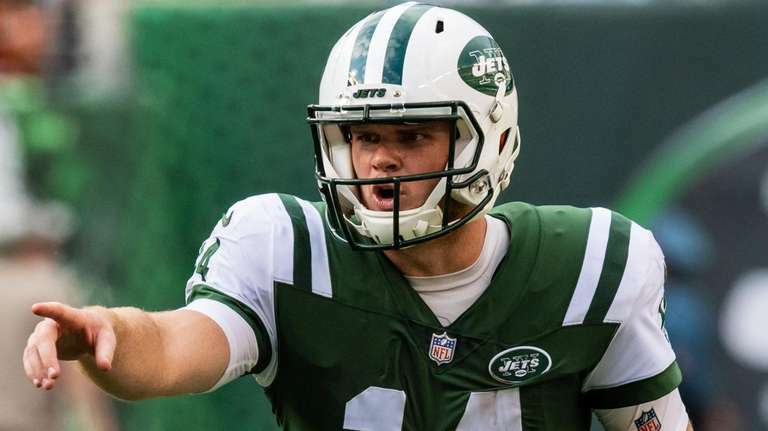 Offensive coordinator Jeremy Bates said Darnold did a good job of that in last Sunday's win and it contributed to the Jets ringing up 512 yards of offense against the Broncos, the most under Todd Bowles. “The tempo as far as the huddle, in and out, was extremely good,” Bates said Thursday. “It starts with the quarterback but it takes all 11 to believe in that. The 15 to 20 seconds is significant because Bates said that’s the goal. He wants Darnold to be at the line with that much time left on the 40-second clock to be able to quickly survey things and not put himself under additional duress. “Anytime it gets lower than that now all of a sudden stress happens,” Bates said. “You’re creating anxiety that’s not needed. When we substitute personnel, we have to hustle in and out, we have to make the call. The Jets, who are going for their second straight win this Sunday against the Colts, have seen Darnold’s comfort level and command of the offense grow each week. As a result, he’s earned the confidence of his teammates. Offensive lineman Kelvin Beachum talked earlier in the week about how he appreciated and applauded Darnold for being steady in the huddle no matter the situation. He rarely gets rattled. His coaches said being more assertive in the huddle was only a matter of time for Darnold. Darnold has talked about things slowing down for him, and his confidence growing. He had the first of what the Jets believe will be many three-touchdown games last week against the Broncos. Darnold also hit on the longest pass play of his career, a 76-yard touchdown on a beautifully thrown ball to Robby Anderson. Bates also gave credit to the offensive line and all the blockers for allowing Darnold to have what he called “quiet feet.” Darnold was only sacked once, and was able to stay in the pocket and scan the field before making his throws.